Earlier this week, Boston's Kiss FM cancelled a meet and greet with beloved songstress Taylor Swift because 4chan and Reddit hijacked the online contest meant to determine who would get to meet Taylor. 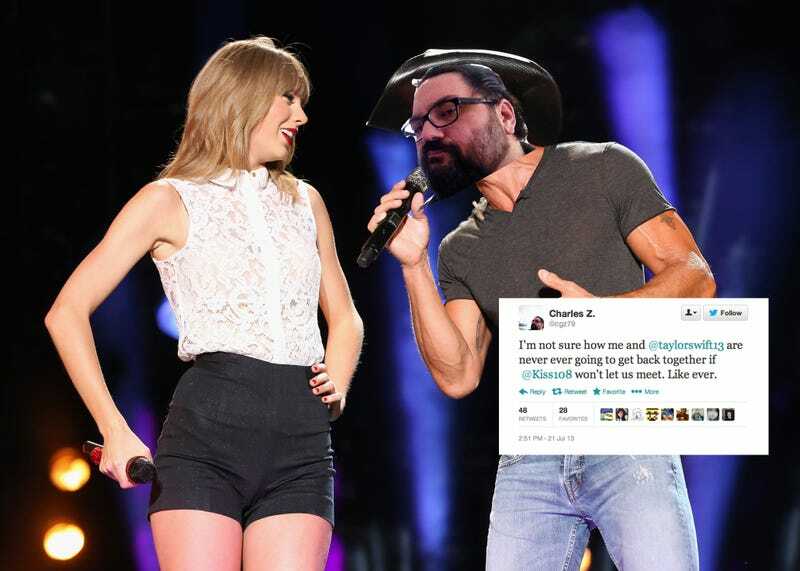 4chan and Reddit helped a 39-year-old man named Charles Z. win, describing him as "creepy" and saying that he wanted to smell Taylor's hair. Now that his hair-sniffing name has been dragged though the mud, Charles has decided to break his silence. In an EXCLUSIVE interview with GQ, Charles Z. said that he wasn't trying to troll Taylor, he really just wanted to meet her! I thought it would be great to meet Taylor Swift, so I told my friends, and my friends told everybody. This became the weirdest possible game of telephone. "I want to meet Taylor Swift!" turned into "What's that? You're a fat, old maniac and want to smell Taylor Swift's hair?" I never asked anyone to do anything other than vote for me. My friends took it and ran with it. I'm not entirely sure what a "4chan" even is. I entered the contest and my friends liked it and started to share it with their friends and it blew up from there. I guess the sorcerers of the Internet adopted me. I'm still not sure what happened, other than that I won, and everyone that helped was awesome. It was like waking up to find a werewolf in your living room. And no one bothered to ask my side of the story before they published. It's like watching a movie about your life written by maniacs. As far as my age goes, John Mayer was in his thirties when he dated Taylor Swift. Is anybody keeping an eye on him? If there's a creep election, I'm going to have a hard time beating him in the swing states. The rest of his internet presence is pretty tame. One notable tweet: "Pretty sure the entire men's rights movement was started by a bunch of 'nice guys' who couldn't get laid." Charles also told GQ that he's never been to a Taylor Swift show, but "We've all had our hearts broken, and she makes sadness into dance songs. She seems like a sweetheart." Just tell that to Amy Poehler and Tina Fey.